This quilted placemat is made with gorgeous organic cotton for both outside layers. A light padding serves as a cushion to help your meal to be as quietly and peaceful as possible. This padding is made out of organic cotton. The placemat is quilted and topstiched for some additional strength. The organic place mat measures 18" x 12" (45cm x 32cm). It is 9" 1/2 x 2" (24cm x 5cm) once folded and rolled up. 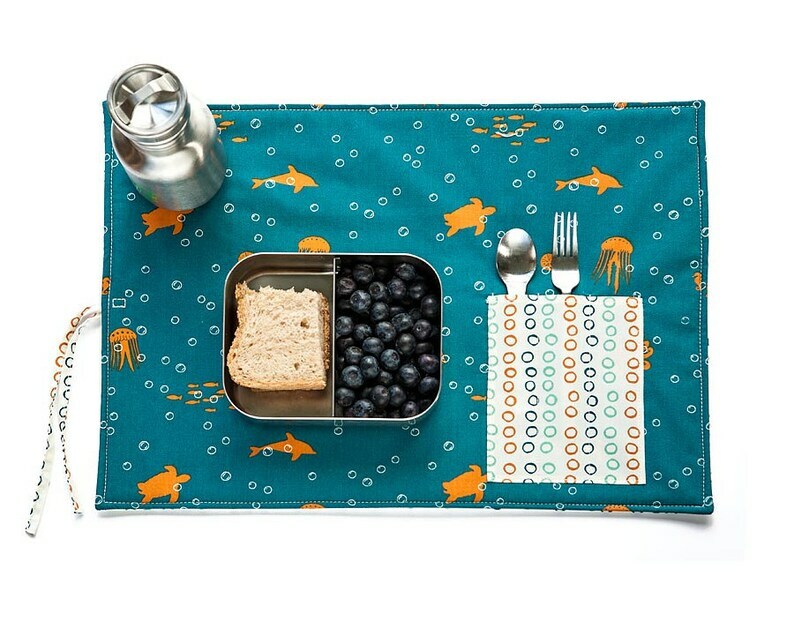 Student gift, bike organic placemat in blue, child place mat for lunchbox. Word traveler placemat for children and adults. Place mat with planes, bikes and trains. Organic placemat for world traveler baby shower. Springtime placemat for children. Place mat with flowers and bikes in orange, yellow and green. Organic placemat with cutlery pocket. Organic placemat, landscape lunchbox set with cutlery pocket. In green and orange. Roll up placemat original design for kids. « Nesting friends » place mat in organic cotton. Groovy girl placemat with ukulele, guitars and VW vans. Organic place mat 70s for her in orange, blue and yellow. Chevron placemat. Organic place mat in turquoise, lime green and black. Gift for kids with sheeps. Placemat with silverware pocket with mythical land fabric. Colorful place mat handmade with organic fabric. Holiday gift for her. Colorful placemat for kids with cutlery pocket. Organic place mat with farm animals.